What the Google is Going On? Home » google » What the Google is Going On? Everyone knows that Google is by the far the most widely used search engine. Website owners who operate online businesses, therefore, spend a great deal of their time and energy competing for rankings on Google. This means they want their sites to show up as high as possible on Google’s results page for a relevant search query. Over the years Google has been fairly hands-off about the strategies webmasters use to boost their rankings – a process known as SEO, or search engine optimization. Recently, however, Google changed their approach significantly. 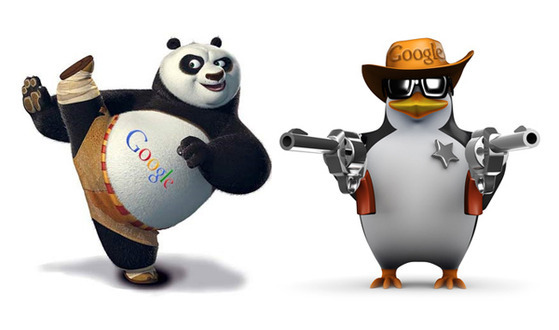 Panda and Penguin are two rather odd codenames for major updates to Google’s algorithm – indeed, to its entire business model. The result of these updates was a drastic drop in rankings and traffic for many websites – although others did notice an increase in these factors after the update. In these recent updates Google primarily focused on several different points. The first step in Google’s gameplan was to deal with the link networks so many poor quality sites were using. Many of the most popular of these link networks websites were deindexed, and before long websites that used them were also penalized. Of course, this meant the income they produced disappeared too. The frustration expressed by some website owners about Google’s updates is due to several different factors. One is simply the fact that since Google is by far the most popular search option online, no good alternatives are available. The second is that with millions and millions of websites competing for just a few spots on the first page, abuse or at least shady ethics were inevitable. Individuals who blatantly practiced this type of promotion probably knew that it would catch up with them eventually, but in Google’s attempt to clean up its search engine results some good, quality websites got caught up in the net too. This, then, is understandable anger, since a lot of hard work and dedication went into creating these established, respected websites, and they were still hit hard. Obviously Google is not perfect, but the company’s overall gameplan is to ensure that the best possible sites are displayed for each query. Although they do not always achieve this goal perfectly, they have already said they have more updates in the pipeline that will hopefully continue to improve their system. Guest post contributed by Hayley Spencer for EasyFinance.com (link removed on request) by visiting their website. Hayley is a freelance writer and a successful real estate investor. Her articles appear on various investment blogs.